Place chicken in two 9x13 inch baking dishes. 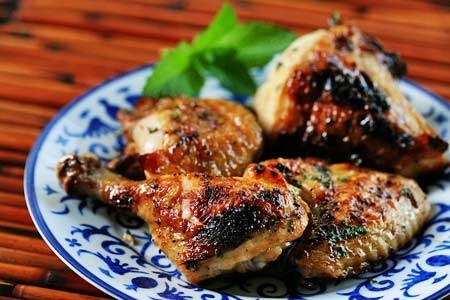 Blend garlic and mint leaves and spread mixture under skin of chicken pieces. In a small saucepan, heat butter, lemon juice and honey over medium low heat; mix well. Brush warmed mixture all over chicken skin. Bake for 1 hour, or until golden brown and cooked through (juices run clear). Brush again with honey mixture, and serve.